The Family Law Awards 2018 were held on Wednesday 28 November at The Ballroom South Bank, one of the most exclusive event venues in London, to celebrate excellence in family law. 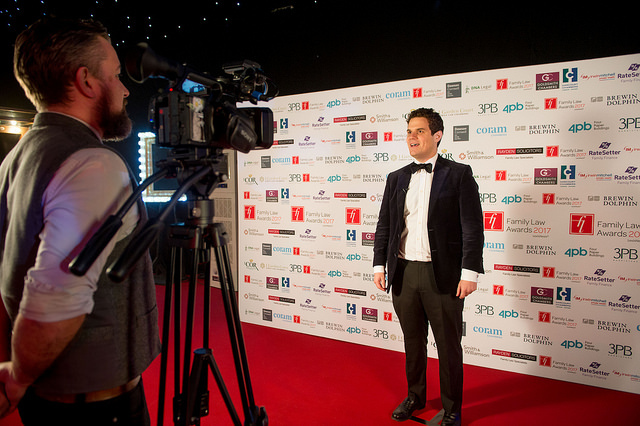 The Family Law Awards offer unique branding and sponsorship opportunities, including extensive pre- and post-exposure through advertising and editorial coverage. Thank you to everyone who nominated this year and congratulations to those who have been shortlisted. Read an account of the evening, see all the photos and the winner photos. Once again we will welcome nominations in both national and regional categories. For further details see the regional awards page. The shortlist and winners will once again be chosen by a judging panel made up of the heads of the Family Law Bar Association, Resolution and the Association of Lawyers for Children, along with Family Law editors and publishing executives. In keeping with tradition, three of this year’s Awards will be voted for by the family law community. A shortlist of four nominees will be selected by the judges from the nominations received and voting will open here in September. Over the past 8 years, the Family Law Awards have firmly established themselves as a highly prestigious event, celebrating the success and achievements of family lawyers and the vital contribution that they make to society. Last year’s ceremony was attended by over 500 guests drawn from across the family law community, including solicitors’ practices, the Bar and the public sector. The Ballroom South Bank is a stunning marquee structure that is situated behind the London Eye and Festival Hall, an ideal location for high-profile awards ceremonies. It is one of the most exclusive event venues in London, the unique and innovative venue will make this year’s ceremony unparalleled in grandeur and excitement. This year’s (optional) black tie event will feature a sparkling drinks reception, three-course meal and the awards ceremony. A DJ, disco and cash bar will ensure that this year’s celebrations continue into the night. The judges have been carefully selected on the basis of their considerable experience and expertise in relation to their awards category and we are delighted that a number of leading figures from the family law profession and beyond have chosen to become involved with the Family Law Awards. LexisNexis and the Knowledge Burst logo are registered trademarks of RELX Inc. © 2018 LexisNexis 352896883.